Home » Sports » Another win for San Pedro Tiger Sharks! Another win for San Pedro Tiger Sharks! The San Pedro Tiger Sharks netted another clear 86-58 victory over the Orange Walk Running Rebels on Saturday, January 26th at the Civic Centre in Belize City. 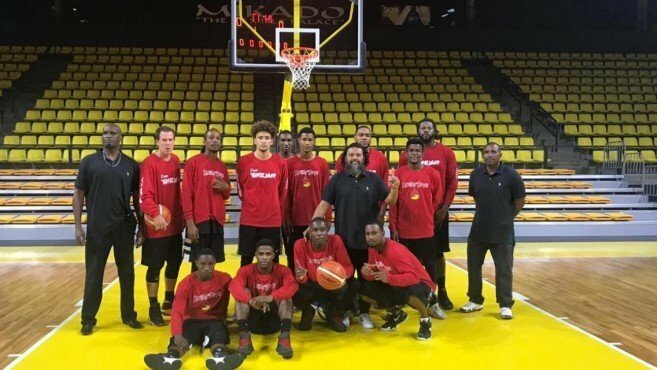 This marks the second consecutive victory for the island team, who is currently leading in the 2019 season of the National Elite Basketball League (NEBL). The island squad quickly took the lead in the first quarter, netting 26-14. The Running Rebels tried their best to overcome the deficit in the second quarter, but their efforts were futile, especially with the back to back scores by Ashton Edwards and Louis Pitterson. By halftime, the island players had a comfortable 47-20 lead. The game intensified for a bit in the second half, but it was not enough for the Running Rebels to catch up. The island squad pressed on, stealing the third quarter to take it to a 61-44 score. Edwards and Pitterson joined forces once again, and assisted by Kurt Burges and Tyronne Edwards; they left their opponent with little opportunities. By the end of the game, the Tiger Sharks crushed the Running Rebels 86-58. Other games held over the weekend included the match between Belize City Defenders and Belmopan Bandits. It was a tight game that had the Belmopan team at a dangerous disadvantage throughout the game. But the Defenders’ did not count with the tenacity of the Bandits, who in the last minutes, stole the game with a marginal 68-66 victory. Dangriga Dream Ballers traveled to San Ignacio Town in the Cayo District to face the hometown Verdes. The Cultural Capital ballers did not waste time on the court, dominating the entire match comfortably. Verdes’ efforts just could not break through the Dream Ballers’ barrier, and its defense could not stop the visitors from scoring. When the time clocked out, the Dangriga squad had drummed up an 82-55 win. Participating teams of 2019 NEBL season will return to the court this weekend as they try to defend their current standings. On Friday, February 1st, the Belmopan Bandits will face the Dangriga Dream Ballers in Belmopan. In Belize City, the Orange Walk Running Rebels will take on Belize City Defenders. On Saturday, February 2nd, San Pedro’s Tiger Sharks will play what is expected to be a challenging match against the current NEBL champions, Belize Hurricanes, at the Civic Centre in Belize City. All games on Friday will start at 9PM, while on Saturday, games tip off at 8:30PM.